Eight rubbers on the bottom, protecting from scratching the floor. With a hollow on the Chair’s back, easy to move. Product attributes: Product Dimension (inch): L14.6*W16.9*H29.5, Seat height : 17 inches(43CM) Package Dimension (inch): L22*W20.1*H31.1 N.W. (lb. ): 26.5 G.W. (lb. 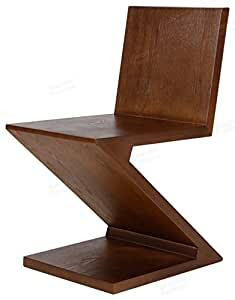 ): 29.3Suitable Places: Living Room, Bedroom, Leisure Areas, Hall, Hotel, Villa, Club Maintenance: no heat Product Story: The Zig Zag Chair was designed by Gerrit Rietveld in 1934. Gerrit Thomas Rietveld (24 June 1888-25 June 1964) was a Dutch furniture designer and architect, and was one of the principal members of the Dutch artistic movement called De Stijl, Rietveld is famous for his Red and Blue Chair and for the Rietveld Schroder House, which is a UNESCO World Heritage Site. Rietveld had his first retrospective exhibition devoted to his architectural work at the Centraal Museum, Utrecht, in 1958. When the art academy in Amsterdam became part of the higher professional education system in 1968 and was given the status of an Academy for Fine Arts and Design, the name was changed to the Gerrit Rietveld Academy in honour of Rietveld “Gerrit Rietveld: A Centenary Exhibition” at the Barry Friedman Gallery, New York, in 1988 was the first comprehensive presentation of the Dutch architect’s original works ever held in the U.S. The highlight of a celebratory “Rietveld Year” in Utrecht, the exhibition “Rietveld’s Universe” opened at the Central Museum and compared him and his work with famous contemporaries like Wright, and Mies van der Rohe.